In the introspective wake of the De-Lovely Cole Porter bio-pic, it seemed like a good time to let bygones be bygones and revisit Country Dinner Playhouse and take in their current production of Anything Goes to see if, in the absence of a couple of years, the latest ownership group had recanted their position that "the future of musical theatre orchestration is a keyboard/synthesizer and a drum set." Filled with memorable tunes and lyrics such as "You're the Top," "It's De-Lovely," "Friendship," "I Get A Kick Out of You," and "Blow, Gabriel, Blow," this tale of a trans-Atlantic crossing rife with romance and intrigue offers a great opportunity for singers, dancers, comedians, and musicians to strut their stuff. And despite the turnover of many talented, long-term ensemble members that used to form the backbone of CDP productions, producer/director Paul Dwyer has assembled a talented crew that matches up well with the book's dramatis personae. Reno Sweeny (Cyndi Neal), the irrepressible golden-hearted unlucky-at-love evangelist turned bar chanteuse, has a soft spot for Billy Crocker (Scott Foster), aide to a wealthy Wall Street investor. 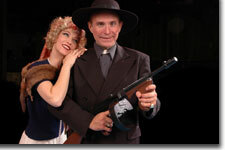 Billy, in turn, is sweet on Hope Harcourt (Erica Hursh), but she's gotten engaged to Sir Evelyn Oakleigh (Chris Keener). They're all thrown together, along with a slew of wacky characters, on a luxury liner en route from New York to England. But alas, the orchestration is so thin that at times it's as if the singers are going at it a cappella, and at other times the tenor of the music is so irritatingly electronic you wish they were singing without accompaniment. So it's a good thing that Neal, in the Ethel Merman role, knows how belt out a song and sell it, and Foster's vocals remain steady without any help from the pit. Their acting holds up as well: Neal imbues Reno with an worldliness that allows her to easily refocus her attentions on Evelyn when Bobby spies his old flame Hope; and Foster's Bobby is a smooth operator, yet unjaded in love. Hursh is glamorous as Hope, and a lithe dancer with great vocal range. She plays the conflicted Hope with conviction, manipulating both Billy and Evelyn with her charms. Keener delights as the clueless uppercrusted but guileless Evelyn; Greg Price is priceless as the madcap Moonface, Public Enemy No. 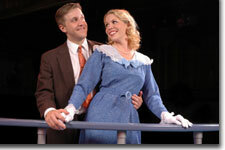 13; and Brenda Faatz livens things up as the classic moll with a tap dancer's heart. At times, though, there are too many dancers on the small stage, cramping the choreography, with the exception of the two tap numbers, which are excellent. And finally, I can't imagine that Cole Porter wouldn't be horrified at what had been done to his score. Yet, despite this travesty, the house on the Wednesday night I attended was close to 90% of capacity, which only underscores H.L. Mencken's comment that, "nobody ever went broke underestimating the taste of the American public." 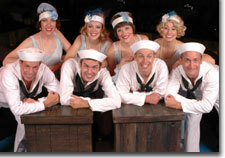 Country Dinner Playhouse's production of Anything Goes runs through November 14th. 303-799-1410.